Today was a lazy day, we didn’t really do much but play on the computer and decorate our blogs. I didn’t even feel like cooking really, but girls do have to eat, so I decided to fix something light for dinner tonight. I decided to make chicken dumpling and make it two ways. The first is potstickers. The recipe is fairly simple, make your favorite dumpling or shumai filling or try the chicken filling below. I usually make pork shumai, but today I wanted to try chicken. It turned out pretty good, for a light, easy meal. Mix all the ingredients together, and stuff a teaspoonful of the mixture into square or round wonton wrappers and seal edges. In a frying pan, heat a tablespoon of oil and swirl to coat the bottom. When heated, place the dumplings in the pan in a single layer and cook until the bottoms are nicely browned. Don’t turn them over, pour about 4 tablespoons of chicken broth in the pan and cover with a lid. Cook until almost all of the liquid has evaporated and the chicken is cooked through. If you feel a longer cooking time is needed, add a bit more broth and cook a little longer. These came out just right, a bit crunchy on the edges, chewy on the underside, and very soft and tender on the topside. Dip them in your favorite dipping sauce. Mine is lemon and soy sauce, the girls prefer sweet and sour sauce or ketchup. Hi Mrs. Tweety and Obachan! The chicken filling actually came out pretty good. This would be great for people who don’t eat red meat. 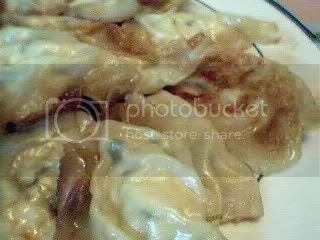 Potstickers looks good.. 🙂 Will try it sometime.. once christmas is over.. overly busy at this moment..!